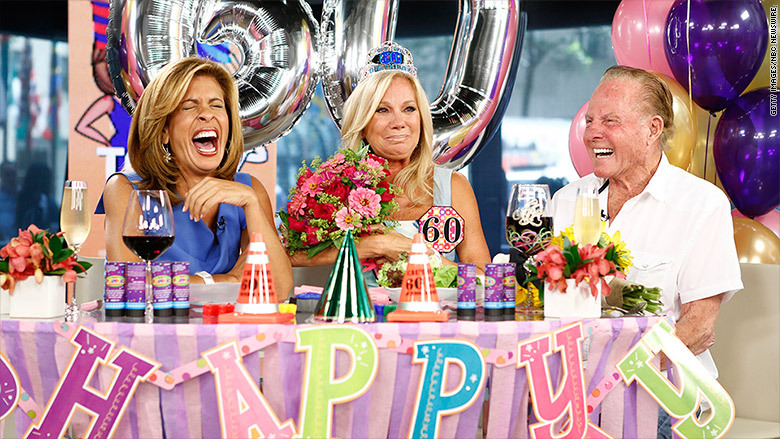 Hoda Kobt tweeted out this photo Sunday with the caption, "This is how I will remember #frankgifford." Hoda Kotb opened Monday's 10 a.m. hour of the "Today" show with a emotional remembrance of Frank Gifford, who died on Sunday. "It's one of those things, Frank weighed 178 pounds. You knew his weight exactly. You knew he was in good physical health, so to hear the news it was shocking," Kotb said Monday morning. Gifford was the husband of Kotb's long-time "Today" show co-anchor Kathie Lee Gifford. Filling in for Kathie Lee on Monday was "Today" correspondent Jenna Bush Hager. Kotb explained to Hager that it was her birthday Sunday and she was flying when the news broke. She found out about Gifford's passing when she was looking through her phone for birthday wishes. While scrolling she saw a text from Kathie Lee that said, "Frank had passed." "I kept reading it, and re-reading it, and re-reading it thinking it couldn't be true," Kotb said. Kotb later became emotional when talking about Kathie Lee and her children. "I am in awe of that whole family," Kotb added with tears in her eyes. Gifford, 84, was a Pro Football Hall of Famer and a sports broadcasting legend being one of the first athletes to make the transition from the field to the booth. He died of natural causes in his Connecticut home, according to his family. Kotb revealed that Gifford had given her advice on how to have "a hit show" with his wife. "He said, 'You have to trust her with everything you have. She's the most trustworthy person I have ever known,'" Kotb said. "And I never forgot that. That showed how much love he had for her." Following the segment, Kathie Lee took to Twitter to thank both Kotb and Hager for their "love and beautiful tribute to Frank." Thank you Hoda and Jenna for your love and beautiful tribute to Frank. I'm in tears.